SSitting proudly between the Minarets and Banner Peak as one of the most recognizable mountains in the Mammoth Lakes skyline, Mt. Ritter (13,143’) finds itself on many athletes’ climbing and skiing ticklists. First descended by John Muir in 1872, with a variation first ascended in 1928 by Norman Clyde, Mt. 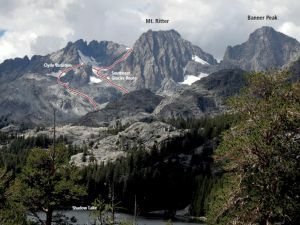 Ritter is an iconic Sierra peak with a rich history. As a fun third class route to the summit of a prominent peak, the Southeast Glacier Route makes for a fun one or two day adventure, and can be timed to be a snow climb or a rock scramble. In the middle of summer, it could likely be completed keeping mostly on dry rock, but in early spring crampons and an ice axe will be neccesary. If you choose to climb the Clyde Variation, the use of crampons is mandatory. Which SuperTopo guidebooks include a topo for Southeast Glacier Route? Mt Ritter and Banner Peak overview.